Without intending to come off as trite, there are occasions when it’s possible to mark certain similarities between a new album and music which has appeared elsewhere in music history, but those moments can still reverberate with excitement because no one saw that music or the connection to anything else coming – from anywhere, ever. 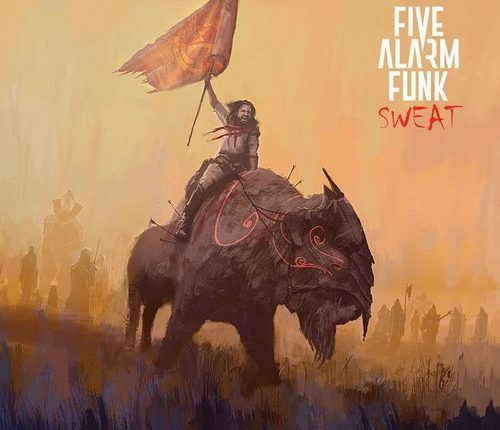 Such a moment hit me the moment that the music on Five Alarm Funk’s new album, Sweat, began to emanate from my headphones and tickle my ear drums. Right off, the jazzy/funk/metallic sound reminded me of the greatest moments Mr. Bungle ever recorded but, perhaps because Sweat is FAF’s sixth album, its presentation is far more focused. “Widowmaker” lived up to its name, in that regard; deadly and sharp, the song made short work of my critical sensibilities as it sliced through my synapses and then and then just cleared the way to leave me looking for more. I didn’t have to wait long or look hard to find more of that with which “Widowmaker” opened Sweat. With the opening song getting listeners primed and ready, a series of successes including “DDPP,” “Freight Train,” “May The Funk Be With You,” “Hot Damn” and the title track await listeners, just itching to go off as soon as they’re touched by the unsuspecting. Each proves to have a design for success set and cemented within it beautifully; with a fantastic horn section adding the color, guitarists Oliver Gibson and Gabe Boothroyd add a layer of grit and growl to each song’s arrangement while bassist Jason Smith inserts some understated teeth and percussionists Tayo Branson, Thomas Towers and Carl Julig add some delightfully malicious swing to the music. Each of those elements helps the songs grab hold of listeners and refuse to let go until the entire duration of Sweat has played through and, while they may resist initially, it doesn’t take those who happen upon Sweat long to be totally won over by it. When the fairly ominous-sounding “10,000 Scarabs” slinks through to close out the proceedings, listeners will find themselves heaving heavy sighs of relief that they made it through all twelve tracks with their heads and body parts intact. The ride was both slick and fierce and they’ll want more – they’ll be hooked. Sweat is out now. Buy it here, directly from the band’s official website.